Was a good hotel for a night or two? Would not recommend for a week vacation stay. 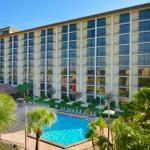 Great location, central to universal and businesses surrounding. I loved the location. The staff was nice. It was comfortable and great location. Bath tub was a little clogged. Very close to Disney attractions and other attractions. Also on the strip with lots of souvenir shops. Good service and excellent restaurant. Windows didn't open to balcony. The pet-friendly Rodeway Inn International is within walking distance of the Wet 'n Wild water park and comprises 315 rooms designed for the vacationer but equally suited to the business traveler. Items included with the room rate at this non-smoking hotel are shuttles to Universal Studios Florida, SeaWorld Orlando and the Wet 'n Wild park, high-speed Internet access, local telephone calls, in-room coffee and parking. The property is located on International Drive which has an array of tourist attractions, restaurants, shops and entertainment areas. Other landmarks and attractions include the Walt Disney World theme parks, several golf courses, numerous shopping malls, historic downtown Kissimmee, Gator World and the Orange County Convention Center. All the rooms have high-speed Internet access, a coffeemaker, refrigerator, microwave oven, IDD telephone, television with cable movie and news channels, pay-per-view-movies, iron and ironing board, in-room safe and a hairdryer. All rooms are non-smoking. This inn has three dining options: The Palm Dining Room offers an all-you-can-eat buffet breakfast, the Lite Bite has sandwiches, salads, a full range of bakery goods and snack items and the Shogun Japanese Steakhouse has chefs that prepare entrees in front of guests. This inn has an outdoor heated swimming pool and a sundeck. The 24-hour front desk sells tickets and has information on the Orlando events and attractions. Other amenities include a gift shop, two video arcade rooms, copy and fax machines available for guest use, a coin-operated laundry, daily housekeeping and ice and vending machines. Guests at this Orlando hotel were pleasantly surprised by the reasonable rates and the great service they received from a friendly and efficient team of employees. Many liked the landscaped grounds and were impressed by the dining options available here, items not normally expected at a Rodeway Inn. The majority of clients said they would return to this property on future visits to Orlando and had no hesitation in recommending the inn to fellow travelers.